The miter saw is perhaps the best thing that ever happened to the wood and metal industry when it was first introduced in the mid-1960s. For the longest time, artisans faced the greatest challenge in making accurate crosscuts and angles on adjoining pieces. Soon enough, picture frames, coffee tables, and wooden shoe racks were being perfectly crafted. The miter saw has a circular saw blade that by default assumes a 90-degree position. This allows it to make the most precise cuts and shapes on wooden objects. This, however, is not its most celebrated feature, the miter saw’s pivoting and adjusting abilities makes it quite handy for complex and high-precision requiring jobs. The availability of miter saws with varying degrees of inclination provides for a wide range of options to handle almost any kind of project. There are three notable categories that miter saws are broken up into, and these categories help the buyer know just what they’re going to get from their new workshop gadget. The first type of miter saw is the compound miter saw. Along with moving left and right, the compound miter saw also has the ability to tilt in one single direction. This allows for the saw to create beveled cuts in your woodwork, and moving it from both of the available axes at the same time allows you to get a compound cut. These compound cuts prove to be the most useful when working with any type of project that requires angled cuts in two different planes. Not every project will require this sort of mobility, but when you encounter one that does, you’ll be glad that you’ve got a compound miter saw at your side. The dual compound miter saw is also quite popular with woodworkers. Dual compound saws function quite similar to their single compound brethren, dual compound miter saws have the ability to tilt both left and right – unlike the singular direction restriction found with traditional compound miter saws. And, finally, there’s the sliding compound miter saw. The sliding compound miter saw has all of the great features that you’d find with a normal miter saw, but also include a radial arm saw. This radial arm saw allows you to move the blade not just left and right, but in a forward and backward motion as well! 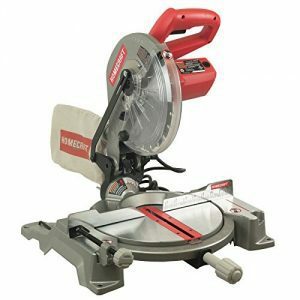 Folks that opt for the sliding compound miter saw are often those wanting to maximize the distance that they’re able to reach with each and every cut. The sliding compound miter saw is able to get the longest cut length of the three, making it a great choice for woodworkers who place a priority on this feature. 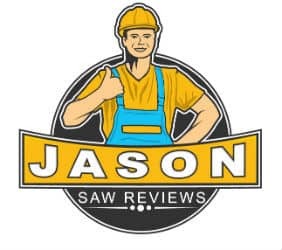 In addition to the different categories that need to be looked at when purchasing a miter saw, there are also various features that you’ll want to keep an eye out for as well. Miter saws are a whole breed of their own, and as a result, have a specific set of features and specifications that you need to keep an eye out for when you begin your buying process. Blade size – Depending on the type of work you’re going to be doing with your miter saw, you’ll want to choose a blade length that will best meet your needs. The most common blade sizes when looking at miter saws are 8, 10, and 12-inches. As you’d expect, the greater your blade size, the longer of a cut you’re going to be able to make in a single pass-through. Dust bags – As you conduct a lot of cutting with your miter saw, you’re consequently going to create a lot of dust from wood shavings that your woodwork is going to produce. In order to keep your workspace as clean as possible, dust bags are set in place as a way to collect sawdust during your cutting process. Laser guides – If getting the most accurate cut is critical for your line of work, you’re going to want to make sure that your new miter saw comes equipped with a laser guide. Laser guides are mounted directly to your miter saw and project a laser beam onto the wood that you’re working with – enabling you to get the most precise cut possible. Positive stops – If you frequently have to make certain angle cuts with your work, positive stops will come in handy quite a bit. These stops are included with your miter saw by default and are preset cut points that allow you to quickly and efficiently make various angle cuts without having to set up certain cuts each time you go to make them. Although there are certainly other features that are worth keeping in mind, these are some of the most important ones that we recommend keeping an eye out for when you begin looking and shopping around for your next miter saw. And, without any further ado, here are five of the best miter saws that you can currently buy. These saws are listed in no particular order, but each one is very deserving of a spot on this list. 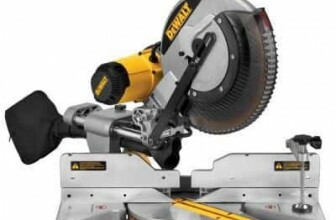 The DEWALT DW715 also falls into the category of a normal compound miter saw. However, DEWALT has done a fair share of their own tweaking to make this stand out from the rest of the crowd. For starters, DEWALT has done something interesting with the positive stops that are included. Although they are set to certain angles and positions out of the box, you are able to readjust these to whatever angles you’d like for them to be. This might seem like a small feature on paper but has the ability to greatly reduce the length of certain projects you’ll encounter. Additionally, the miter detent plate, that has 11 positive stops, can be adjusted as well. As great as that already sounds, the goodies are far from over. If you’re someone who does a lot of vertical cutting with your work, the DEWALT DW715 might be the perfect companion you’ve been searching all this time for! When working with crown moldings, the DEWALT DW715 is able to cut up to a height of 5 1/4-inches. When working with base moldings, that height goes up to a whopping 6 1/2-inches. The sliding fence that’s bundled with the DW715 also helps to ensure that these cuts will slide nice and securely during your work. Also featured here with the DEWALT DW715 is a motor that’s rated at 15 amps, no-load speeds of up to 4,000 rotations per minute, and 4 steel bevel stops that allow for even more versatility within your cuts. Plus, the cherry on top comes in the form of a 3-year limited warranty and a 1-year period of free service work if/when it needs to be done. 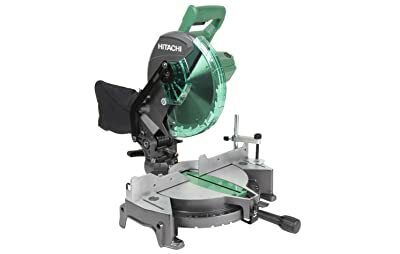 Hitachi’s C10FCG also falls into the category of a single compound saw, meaning that you’ll be able to move the blade both left and right when it comes time to perform your woodwork. The actual range for these left and right movements comes in the form of a 0-52 degree range, meaning that you’ll have a surprisingly wide range of angles for cutting when you consider the relatively compact design of the C10FCG. And, when it comes time to make vertical cuts, Hitachi has included an extended flip fence that has the ability to raise up to 4-inches in height – a feature that will prove to be incredibly convenient when cutting crown moldings from a vertical standpoint. Top this off with the bevel range of 0-45 degrees to the left for some of the most precise cuts possible, and we’re already looking at a pretty sweet deal. However, that’s not all that the Hitachi C10FCG has to bring to the table. While this compound saw is certainly capable of making some rather versatile and impressive cuts, it also does quite a lot with the end user in mind. There’s a likely chance you’re going to be doing a whole lot of cutting with this thing, and with that thought in mind, Hitachi has padded their horizontal handle with a soft and vibration reducing grip. Not only does this included grip add a great deal of comfort to the overall handling experience, it also allows you to get an even better control of the C10FCG than you might have thought possible. And, as we talked about above, the Hitachi C10FCG also comes equipped with positive stops and an attached dust bag to keep your workspace free of wood shavings. Combine all of this with a 5-year Professional Warranty and an incredibly durable design, and we’ve got a pretty capable package with the Hitachi C10FCG. Single compound miter saws are great, but what if you need even more versatility when it comes to your woodwork? If this is the case for you, the DEWALT DWS780 is absolutely worth checking out. 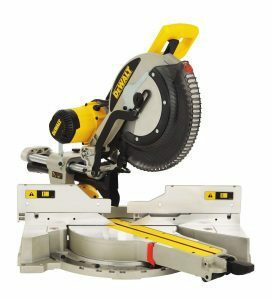 This particular product is categorized as a dual compound miter saw, meaning that you have the ability to tilt both left and right – unlike the single movement of normal compound saws. While that added versatility is nice on its own, DEWALT decides to go the extra mile to make the DWS780 as powerful and functional as humanly possible. This is first seen with the DWS780’s XPS positioning system. This system is a great companion when it comes time to make any sort of crosscuts and even allows you to have access to an adjustment-free indication of your cutting line. If you’re someone who needs to have one of the most precise cuts on Earth, the DWS780 was built with you in mind. But, as you’d probably expect, DEWALT didn’t stop there. Another great feature that’s included with the company’s DWS780 is one of the most efficient dust collection bags we’ve ever seen on any type of miter saw out there. The system that DEWALT has created for the DWS780 allows for over 75% of all your dust shavings to be collected, meaning that your work area will stay cleaner and neater than you probably ever thought possible. And, on top of this, DEWALT has also added 10 positive stops for the DWS780. But, just like the DW715 above, these stops can be adjusted to accommodate whatever angle or size you would like. Powering this whole show is a 15 amp motor that’s capable of delivering 3,800 rpm, and a super durable and rugged design. The next item on our list is the only one to feature a sliding compound miter saw design. 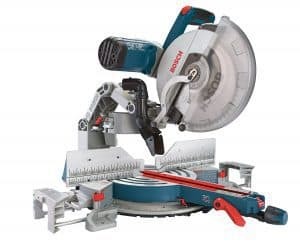 As a refresher, sliding compound miter saws include all of the functionality you’d find in a normal compound miter saw, with the inclusion of the ability to move the blade forwards and backward. The range of motion makes the Bosch GCM12SD the most versatile on our list, and the saw’s patented axial-glide system only re-enforces that idea. This system allows the Bosh GSM12SD to not only make precise cuts but also makes it incredibly durable and compact at the same time. This is a combination that you’re not likely to find in the world of miter saws, so the inclusion of it here makes the Bosh GCM12SD all that much more enticing. Combine this with the horizontal capacity of 14-inches, and we’ve got an easy winner on our hands. And, finally, we’re rounding out our list with the Homecraft H26-260L. 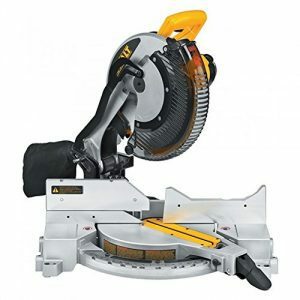 This particular saw is one of the compound nature and has one of the most lightweight designs that you’re going to find for a miter saw in this category. Along with being able to be easily moved from room to room, the H26’s ability to be used with virtually any saw stand further increases to the portable nature of what Homecraft was trying to achieve here. The ergonomic handle makes handling the H26 comfortable and safe, and the LockOut switch helps to prevent any unwanted use of the H26. If you’re looking for a portable, compact, miter saw that gets all the basics right, this is one that’s absolutely worth your time and attention. No matter what kind of workshop you have, there’s no denying the iconic look and utility of a miter saw. Miter saws are one of the most notable types of saws out there for any workshop, and they allow you to make extremely accurate crosscuts and miters in the wood that you’re working with. Miter saws are commonly used for working on picture or door frames, window casings, and even crown moldings. As you shop around, you’ll quickly notice that all miter saws come equipped with a blade that’s attached to a swinging arm. This arm enables the blade to move both left and right and allows for the extreme versatility you tend to find with these types of saws. Making crosscuts is without a doubt the most common use of a miter saw. It involves cutting a piece of wood across the grain or at a 90-degree angle. This mostly provides a stable base for a piece of furniture. It also serves to offer a surface that can be used to attach two objects. A miter saw can similarly do rip cuts – which is a fine cut that’s done along the length of a piece of wood. Aside from the crosscut, a miter saw can be used to make miter joints. These joints are most often found on doors, skirting boards and other furniture equipment. The most common include the 30-degree and 45-degree joints. To get a perfectly fitting joint, you will need to halve the total angle degree in order to get your preferred angle size. A 30-degree angle joint for instance, will require a 15-degree cut. Always be keen while cutting to get the best result. The miter saw is also used for these kinds of joints. The bevel joint for example involves cutting almost similar shapes on two opposite ends of a piece of wood and joining them. For compound joints, the cuts are made in a lock and key manner with one cut getting inserted into the other. The result is an interlocking joint that is reinforced with an adhesive or any other material. A miter saw is also useful when it comes to trimming. This is particularly helpful when handling framing jobs or trimming down wall studs. A trim saw can accurately trim wood frames to the desired length as well as cut the needed angles in minutes when framing. 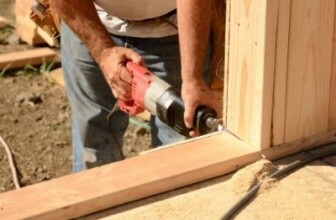 Furthermore, when trimming wall studs, a miter saw is useful as it allows to trim pieces of wood to a desired length and width. Trimming edges of wood planks is also an essential part of roofing. You will be able to cut wood planks to the desired length especially in sharp corners where it is impossible to work with other tools. For instance, if you need to cut a ramp angle on a piece of wood for a roofing section, it can be done better using a miter saw. Also, fencing is a task that requires cutting post, and what better tool to use other than a miter saw. Water and electrical pipes can similarly be cut with a miter saw. Pipes are difficult to cut and need proper handling to prevent unnecessary cracking while cutting. But do you know that a miter saw is an ideal tool for cutting electrical and water pipes as it can cut and slide trough plastic without creating uneven edges? Well, the result is a smooth edge that allows an even and seamless connection from one pipe to the next. There is no better tool to cut repeated pieces of wood of the same length and width for flooring than a miter saw. The pieces used for flooring need to be accurately cut such that the pieces should precisely fit to produce an even surface. Better yet, the miter saw is ideal for cutting notches and shaping floor planks, especially around the corners. 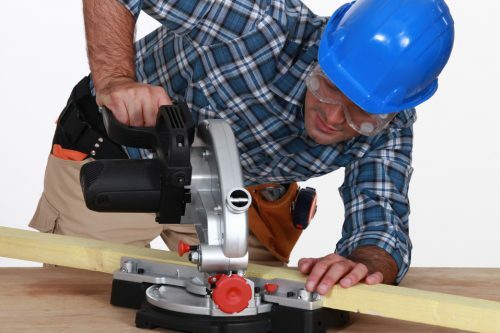 Failure to take safety precautions when using a miter saw can result in grievous harm. It is advisable to be cautious whenever you are using this equipment. A clean and orderly work area is crucial to your safety when using a miter saw. Get rid of unnecessary items that may get in the way of your work. Any liquid spills should be wiped off, and the area should be well lit. Similarly, ensure no flammable materials are within your working area. Gas cylinders, petrol and other substances that can ignite a fire should be kept away from your place of work. Your work area should be restricted to children and should only be accessible to adults. Handling and use of the miter saws should be restricted to only trained personnel. Always ensure your miter saw is switched off and unplugged from the power source when not in use. When working, ensure you only switch on the miter saw when you have all things set and ready to get started. If the saw has a long electric cable attached to it, ensure it is stapled or taped to the ground to prevent you from tripping. Additionally, electrical cables should be connected to the recommended plug to avoid electrical faults and injuries. In the event that the electric cord has a reel, ensure that it is fully unwound before being used. Battery powered miter saws can also pose a danger if not well handled. Ensure the batteries are stored away from harsh elements including heat, humidity, and other unsuitable conditions. Sharp objects should also be kept away from batteries. Immediately after buying your miter saw, ensure you secure it on a firm stand using tight bolts and nuts. This prevents any movements that may injure you while working. Always ensure that long pieces of wood are clamped or held on tightly when cutting along the grain. Loosely held strips of wood may accidentally hit you after being cut from a wood block. All wood that has been cut should be well stacked away from the work area to prevent you from being tripped and falling over. When working, wear proper protective clothing like goggles, gloves, overalls, proper leather boots, dust mask, and ear muffs. Protective clothing may help mitigate the extent of injury caused by the fast rotating blade. The noise and dust generated while cutting can also have a long-term effect on your health if not taken care of. It is important to note that safety clothing should be well fitting. 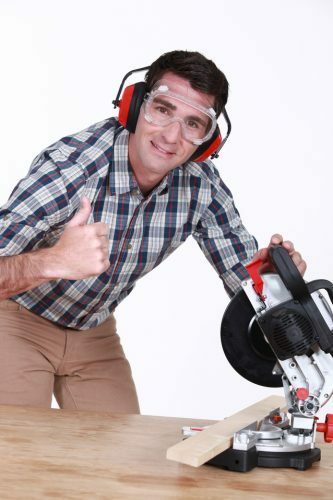 Loose hanging ends, unbuttoned garments and ties should not be used while operating a miter saw. Blades: Having multiple blades with different serrated patterns is absolutely necessary. A blade that can cut through wood may not be similar to one cutting metal. Plastic cutting blades also have a different structure. Ensure you get a blade for every job so to avoid the hassle of having to rush to the store whenever a need arises. Stands: A proper stand is an important value-add to the list of essential accessories. If you constantly cut through and along lengthy pieces of wood, then a stand is a must-have accessory. With a stand, you can easily work on the wood because it supports not only the wood but also the miter saw. Also, make sure to get a stand that can extend outwards in order to support those long pieces of wood. Clamps: Clamps come in handy for both wooden and metallic materials. Whenever cutting is involved, a clamp helps in a great deal by making the job quicker and lighter. Once clipped, it frees your hands and lets you focus on the main task- which is making precise and accurate cuts. Ensure to get a clamp that matches the nature of your job and the material you are work on. If you are dealing with thick and heavy material, grab a strong metallic clamp to help you get the work done. Protractors: This tool is for the diligent worker who strives for perfection. To get neatly cut angles for door and picture frames, you will need to get yourself a protractor. Getting the perfect miter joint is always a tough job that requires high concentration levels and precision. If you find yourself off by a few degrees, then it would probably be wise to grab yourself one of these. Whether you are a professional or a starter, a good result will always be satisfying. Guard: The miter saw blade guard is located around the blade. The guard is designed in such a way that it covers the top half of the miter while the bottom portion is attached to a hinge. The guard is primarily designed to protect the operator as well as the blade while using the miter saw. Table: The large flat part to which the saw is attached is what is called the table. The table serves as the actual base for your work area and the saw. This part has several components attached to it. The table has a slot where the blade can slide in as you bring the miter saw down to a work-piece. Fence: The sturdy flat surface that allows you to place the workpiece up against to offer stability is called a fence. The fence is directly mounted on the miter saw table and is positioned perpendicular to saw’s position. The fence has features that allow you to effectively move to different parts or even allow more convenient measurement of a work-piece. Vise: A miter saw is fitted with at least one vise grip on one side. The vise is meant to offer stability to the saw. Besides, it is used to hold longer wooden work-piece in place, keeping the pieces supported as the blade is lowered into them. As a result, more accurate pieces can be cut using a miter saw when they are held using a vise grip. 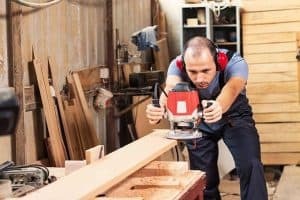 How much does a miter saw cost? The price depends on the specifications of the saw you choose. A saw with multiple features will always be a bit expensive. How do you care for and maintain a miter saw? Store in a clean place away from direct sunlight and water. Make sure to clean it after each use and store safely. Can a miter saw cut both metals and wood? That depends on the type of blade installed. 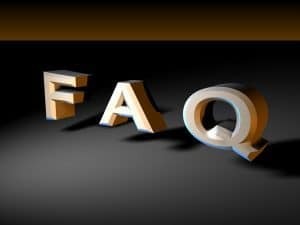 Materials are blade specific – metal blades only work on metal. Which metal is used to make the blade of a miter blade? Carbon steel is the most commonly used metal to make miter saw blade. This is because carbon steel is one of the hardest metals that provide the needed strength and durability. What is an arbor and what is it used for? An arbor is a forged bolt used to hold the blade securely to the miter saw. When securing the saw you have to turn the bolt anti-clockwise because it is reverse-threaded. In summary, a miter saw is indeed a great tool. It has significantly transformed how we do work by enhancing efficiency and improving the quality of the end result. If you intend to buy one, make sure you find the miter saw that best fits your work demands.